What's amazing is the level of detail: you can see that the modeler (Elissandre Rogrigues) started from a set of plans, shown in the first part of the video. The ship itself, objects on board, and all of the textures and graphics - terrific details. On the YouTube page for this video, Ellisandre is nice enough to provide a download link for the SketchUp model, which is about 43 Mb. I got it and toyed around a bit - by driving a section plane through it I saw that the bottom of the ship is hollow - if he had included all staterooms and mechanical equipment, the model could have hit 100 Mb, which would basically be unusable on a regular computer. According to the comments, this model was completed in 25 days, over 150 hours. Great accomplishment! Geometry students learn that you can create a circle that passes through any three points, as long as the points are not colinear (do not lie on the same line). My January project for the Math Forum (it's free!) 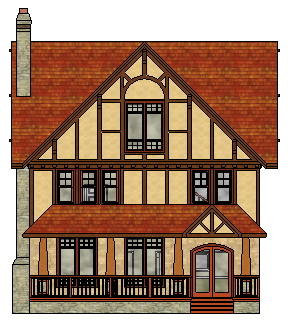 shows how to do this in SketchUp. It's pretty simple, you just need to create some groups. About a year and a half ago I wrote a review for the book "SketchUp 7.1 for Architectural Visualization" by Robin de Jongh. I really enjoyed that one, and learned a lot about rendering, so when I was contacted by Robin's publisher at Packt Publishing to write another review for his new book I readily agreed. Robin's new book is "Google SketchUp for Game Design." It's available both as an e-book and in print (and Kindle and print from Amazon). This book actually targets two industries: game design and film / stage. Both use storyboarding to lay out scenarios, and Robin explains how to do this in SketchUp, helped by other applications. I'm not an expert (to put it generously) in either field, so the fact that this is a self-stated "Beginner's Guide" is great for me. To be clear, this isn't a book that teaches SketchUp modeling, though there's nothing presented that requires advanced SketchUp skills. But you'll be ill-served if you pick up this book with no SketchUp experience at all. This book is really about integration - combining SketchUp skills with skills in other applications. Like Robin's previous book, this one is quite fun to read. Robin is very funny, and while this one isn't as laugh-out-loud as his first one (maybe his editors wanted this one to be more serious), the intro to each chapter is something to look forward to. And his casual, informal, writing style makes this book a lot more fun than your typical, dry "how-to" book. And like in his first book, Robin's passion for free stuff comes through loud and clear. He uses free software for graphic editing (GIMP), and finds places to download free models and textures (CGTextures). 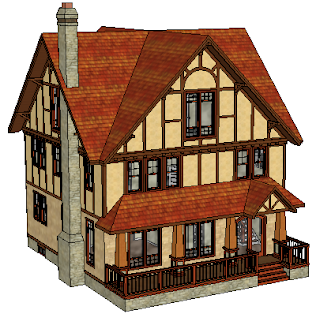 He demonstrates using Unity 3D for setting up the environment after importing SketchUp assets (terrain and buildings and props). He also focuses on doing things as easily as possible - such as making model changes in SketchUp, rather than in more complex app's like Unity. There's a lot in here about textures and materials. 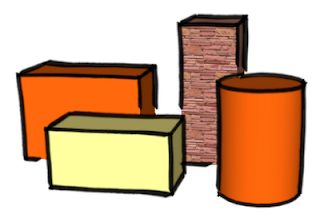 Not just how to use them in SketchUp, but the most efficient way to use them. Game design is all about speed, and Robin goes into detail about how to reduce the size and number of graphics to keep things running well. This is an important concept for any modeler, but particularly for the target audience of this book. He devotes a chapter to terrain modeling, which makes sense - game environments (like the real world) aren't always flat planes. By combining plan view graphics and textures with the Sandbox, Stamp, and Drape tools you can build game-worthy spaces. The second-to-last chapter is my favorite - I've been meaning to write something like this myself for a while - how to design a realistic-looking car in SketchUp. It's a fun project that requires some patience, done with a set of easily-downloadable car plans and some car photos. The resulting model is quite rewarding. By the end of the book, you're walking around in your own game environment, complete with assets (buildings, cars, tools) and backgrounds and lights. The appendix demonstrates an app I hadn't heard of - MakeHuman, used for, well, making humans. 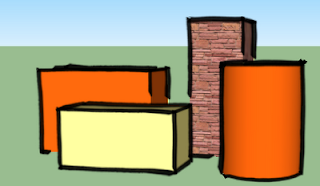 This is another tough task to accomplish in SketchUp alone, and every game (or stage or movie set) needs a bunch of those pesky humans in it. My one complaint (if that's the right word) about Robin's first book was that its black and white graphics didn't always convey very well. This new book is also printed in grayscale (I didn't see the e-book but I assume it's in color). But the pictures look much better in this new book - even in grayscale everything is crisp and easy to identify. If you're thinking of trying your hand designing games or film sets, this book is a great place to start. I know a lot of teenagers who would go nuts trying out the book's projects. I imagine that someone who becomes really proficient in the applications shown in Robin's book would be well on their way to a cool career. What's Coming in Our January Projects? We have great projects coming out next week, by teacher request. If you're not a subscriber, you can sign up here. 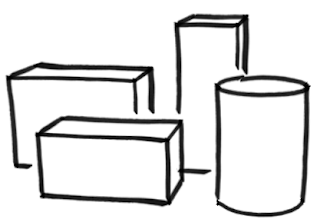 You know how easy it us to use your middle mouse button to orbit around to any isometric view of a model. 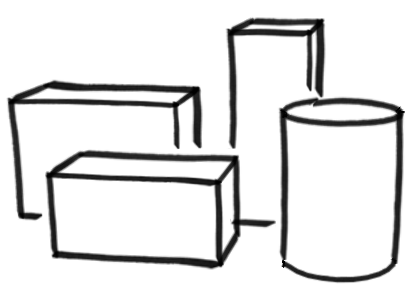 Recently I've had several teachers ask how to produce standard orthographic views (front, top, etc.) 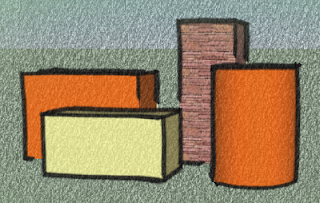 of SketchUp models. This project shows how to easily produce these views, as well as how to save them for easy display. 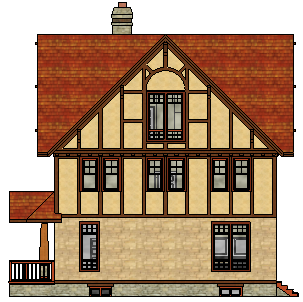 You've probably checked out the various styles provided in SketchUp, and maybe created some of your own. This project will show you how to mix styles - combine properties of styles into one, new style. This fun project is a favorite in the enrichment class I teach - it's easy and produces an interesting result - a "tunneling" animation into a set of ever-shrinking hexagons. To get these cool projects, and 11 more sets throughout 2012, please sign up here - it's just $36 for the year!